Donald Yacovone is an Associate at the Hutchins Center for African and African American Studies, Harvard University and an Athenæum member. Oompa-Loompa illustration by Joseph Schindelman, copyright © 1964 and renewed 1992 by Joseph Schindelman, from CHARLIE AND THE CHOCOLATE FACTORY by Roald Dahl. Used by permission of Alfred A. Knopf, an imprint of Random House Children’s Books, a division of Penguin Random House LLC. All rights reserved. Inverting history in a way that would have shocked Dahl, the new film may star the African American actor, comedian, and singer Donald Glover as Wonka. Newsweek quoted Dahl’s widow, Felicity d'Abreu Crosland Dahl, as saying that her former husband’s original scheme was to have Charlie, the boy who finds the golden ticket that gets him into Wonka’s legendary factory, be “a little Black boy.” In a BBC radio interview, she declared it a “great pity” that Dahl (who at the time was married to the American actress Patricia Neal) bowed to his publisher’s wishes and dropped the idea. This latest possible remake would go far beyond anything Dahl could have envisioned. But will it go far enough? Does Donald Glover, or anyone else associated with this new effort fully understand what is at stake? 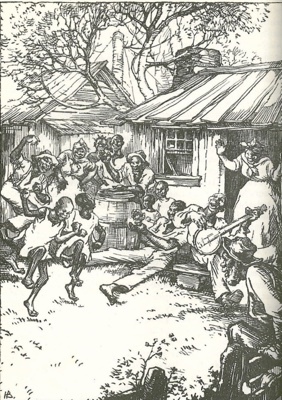 Because Britain the slave trade had outlawed the trade in 1807, as Wonka alluded to, he smuggled the slaves into England in packing cases, in conditions that sounded almost as horrific as the Middle Passage. And so that no one would miss the point, Joseph Schindelman’s images of the Oomp-Loompas in the book showed them as animal-skin clad jovial Sambos who just loved their labor. Drawing by Hanson Booth, in Fremont P. Wirth, The Development of America (New York, 1936), 352. 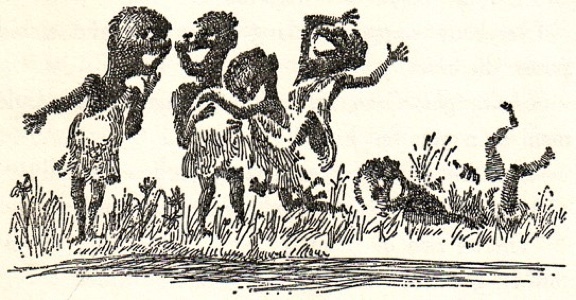 Riveting the idea that these black pygmies were Wonka’s property, to which he could do whatever he wanted, the Oompa-Loompas were subject to hair-growing medical experiments and product testing that turned the little pygmies into blueberries. The entire Wonka enterprise relied on slavery and complete racial subordination. Dahl, as he later confessed, grew up with an imperialist frame of mind. While in prep school, for instance, and dreaming about gold and an adventurous life that might be awaiting him in Africa, he remarked, “Sometimes there is a great advantage in traveling to hot countries where niggers dwell.” He carried that attitude to Africa just before World War II when he labored for the Asiatic Petroleum Company in the former German East Africa, then known as Tanganyika. His imperial enterprise and his experiences with the servants he commanded, and whom he labeled “boy,” and the native Africans he encountered, would shape his racial views and tincture almost all his future writings. If we are to surmount the ugly legacy of Dahl’s work, the kind of imagination that Lin-Manuel Miranda applied to his blockbuster Alexander Hamilton is necessary. But to create a counter-narrative of America’s origin story that attacks white supremacy racial subordination, Miranda needed not just talent and imagination, but awareness, facts, accurate knowledge of this nation’s (racial) past. It’s a lofty goal, but it can’t be done right without the awareness that history and knowledge brings.